Heat oven to 350°F. In medium bowl, mix flour, baking soda and 1/2 teaspoon salt; set aside. In large bowl, beat softened butter, granulated sugar and brown sugar with electric mixer on medium speed about 1 minute or until fluffy; scrape side of bowl. Beat in dry pudding mix. Beat in eggs, one at a time, just until smooth. Stir in vanilla. On low speed, beat flour mixture into sugar mixture until well blended. 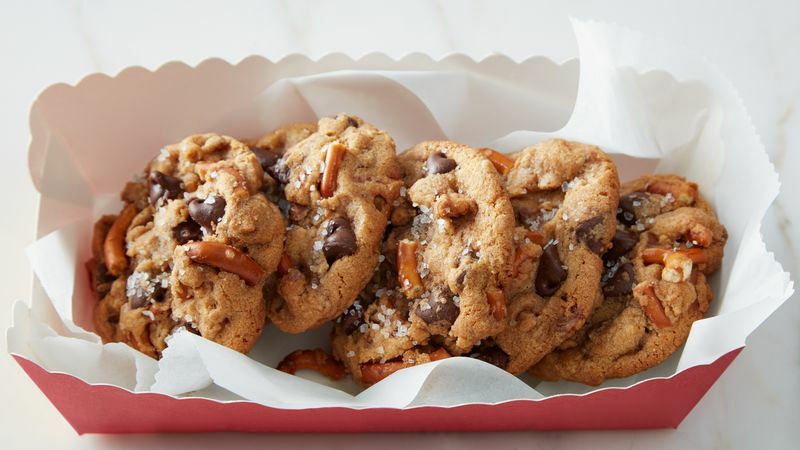 Stir in crushed pretzels, chocolate chips and toffee bits until blended. Drop dough by rounded tablespoonfuls about 2 inches apart onto ungreased cookie sheet. Sprinkle each cookie lightly with coarse salt. Bake 9 to 11 minutes or until light brown. Cool 2 minutes; remove from cookie sheet to cooling rack. Cool completely, about 15 minutes. Store covered in airtight container at room temperature. For success in this recipe, pudding mix is not prepared but added dry to the butter-sugar mixture.